What is the difference between this program and apprenticing on a farm? This program offers a more formal, intensive approach to a farming education, with a weekly classroom day taught by a wide range of experts, including farmers, University professors, extension agents, and other professionals working in the local food system. In addition to the classroom curriculum, participants gain in-depth experience through managing the 10-acre Catamount Educational Farm with staff instruction, working alongside seasoned farmers with diverse business models, and visiting other local farms. Students also design and complete an independent project that allows them to further explore their specific interests. Unlike being an apprentice on one farm, where your main responsibility is to be a worker on the farm, the UVM Farmer Training Program offers time and resources for learning that a traditional farm apprenticeship cannot provide. What is the weekly schedule and time commitment for the program? Students are on the farm Monday-Thursday 8:30-4 and Friday 8:30-2:30. This allows students to find employment on Friday afternoons and weekends. Students typically devote 40 hours a week to this program, which includes the time on the farm, reading assignments and projects. 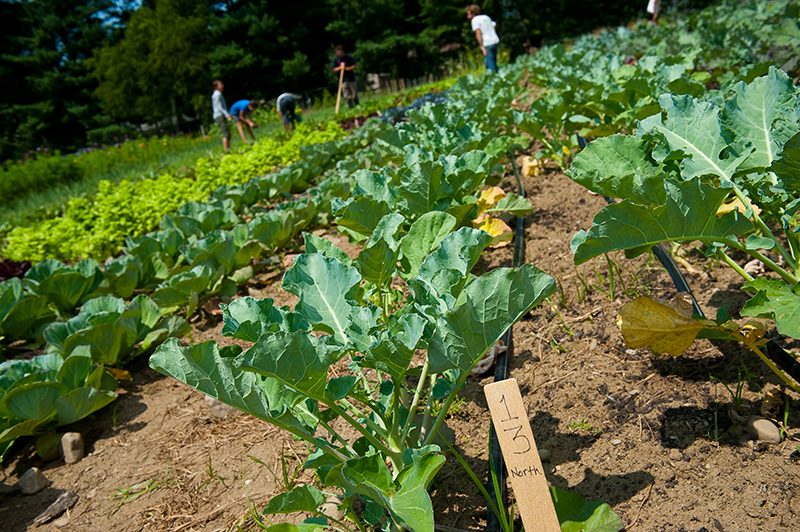 Some weeks will require a little more time to complete assignments and when students are on the farmstand rotation. Here are more details about the weekly schedule. Is this program right for someone with little experience in farming? This program is geared for beginning farmers who have shown enthusiasm and commitment to sustainable agriculture. If you have not yet worked a full season on a farm, you can demonstrate that commitment through volunteering on a farm, attending conferences, WWOOFing, having a community garden plot, taking relevant courses, etc. What work is required off the farm? Each week students are assigned readings that correspond with the weekly classroom presentations. There are other projects that students are expected to complete including a crop planning exercise, farm financials and business planning project, soil fertility management exercises and a final independent project. Every other week an assessment will be administered to help students determine if they are meeting the learning objectives. Students are responsible for finding their own housing in the Burlington area. They can choose to live in the thriving downtown area or in one of the nearby communities, opting to rent an apartment or a room, or share a house, depending on their preference. Students should expect to pay between $500 and $800 per month for housing. We also support accepted students by connecting them with others in the program who are looking for group housing. The Farmer Training Program will award five $2000 scholarships to applicants accepted into the program. The first scholarship round will offer two scholarships. The due date is December 1. Decisions will be made by December 15. The second review cycle will award three scholarships and has a due date of February 1. Decisions will be made February 15. If you apply for the November cycle and do not receive a scholarship, you will automatically be considered for the February cycle. The Scholarship Committee in Continuing and Distance Education will review scholarship applications. There are other regional and national opportunities worth researching and applying for. A few great examples: Future Organic Farmer Grant Fund and VSAC Grants for non-degree courses (VT residents only). Women applicants can apply for scholarships from Les Dames d’Escoffier International. AmeriCorps educational stipends and the VA GI Bill can also be used to cover tuition. The Farmer Training Program is a non-credit program, and therefore it is not eligible for financial aid, work study, or University loan programs. There are currently loans available for non-credit programs through Sally Mae. How many people will be in the program in 2019? For 2019, the program is limited to 25 students. What is the tuition for the Farmer Training Program? For 2019, the program tuition is $6,300, which does not include housing or meals. Besides tuition, what are other costs involved with attending this program? What do participants do with this certificate? Many participants use their experience in the program to start their own farm and food businesses or work for another farm. Graduates become educators or work for non-profits and other organizations, helping to reform our food system and increase access to local foods. This practical training program helps prepare students to be effective workers in the local, sustainable food movement as it continues to grow and create new job opportunities for qualified people. See our alumni page for profiles of our alumni and how they have incorporated their experience into a career.